These breakout boards come mounted in an attractive case, and they bring all fifteen pins plus shield of a DB15HD (High Density) connector out to spring terminal blocks for easy connection and prototyping work. They are available with either Thumbscrews or Jack Screws for connector hardware, and Spring Terminals for wire connections. See Pricing table below for all part numbers. This breakout board is perfect for production applications as well as experimentation and prototype work. 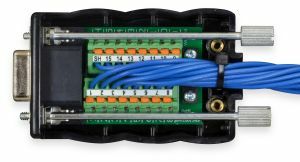 They are well-suited for interfacing with data acquisition equipment or any other devices that use a DB15HD connector. A breakout board is sometimes referred to as a "transition module", "terminal board", "terminal block", "breakout box", "breakout adapter", "terminator", or "interface module".